Today I will be reviewing the Lamptron FC-5 fan controller. I had initially purchased the Scythe Kaze Server fan controller and ended up giving it a review first. 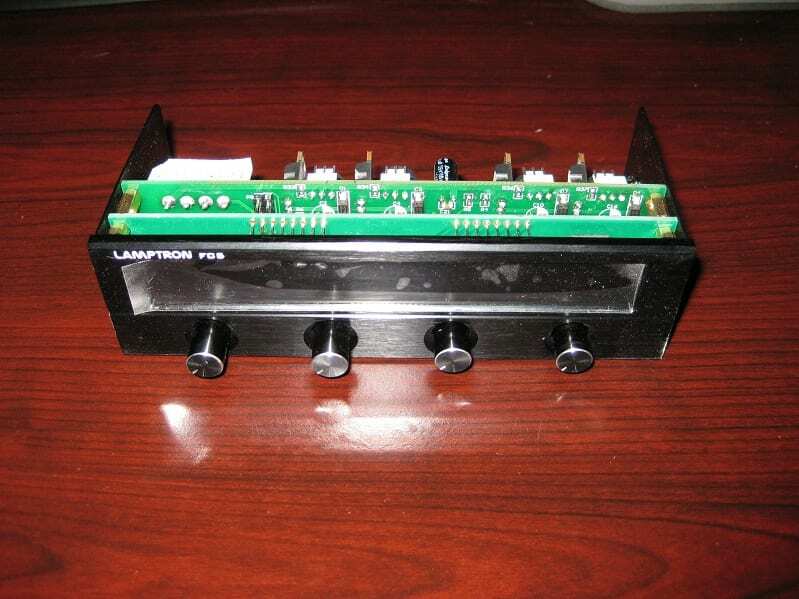 Truth be told, I wanted to purchase this Lamptron unit over the Kaze because of the more powerful 30W per channel specifications and multi-colored LCD alone. Sadly, it appeared to be sold out every where I looked at the time. Now however, I have one in my hands to review! The FC-5 comes in its box surrounded by pre-formed Styrofoam making a nice snug fit. The contents include the fan controller, four temperature probes, four 3-pin fan power leads, the MOLEX DC power lead, mounting screws, an extra jumper, instructions, and a nice color catalog showing off Lamptron’s product line (not pictured). The faceplate on this controller comes in a CNC milled 3/4″ thick solid aluminum with a brushed finish in either black anodized or silver aluminum. The front panel layout is very simple and pleasing to the eye with only four knobs to adjust, one for each channel. All changes to the color of the LCD, alarm function, and the display readouts are handled by moving jumpers on the back of the controller. For colors, you have a choice of Red, Yellow, Green, Cyan, Blue, Purple, and White. 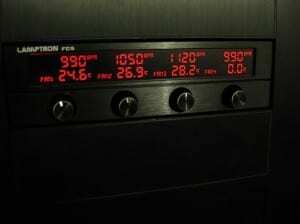 The user has a choice of displaying Celsius, Fahrenheit, or Voltages for the bottom line readout allowing for a bit more flexibility than other controllers on the market. 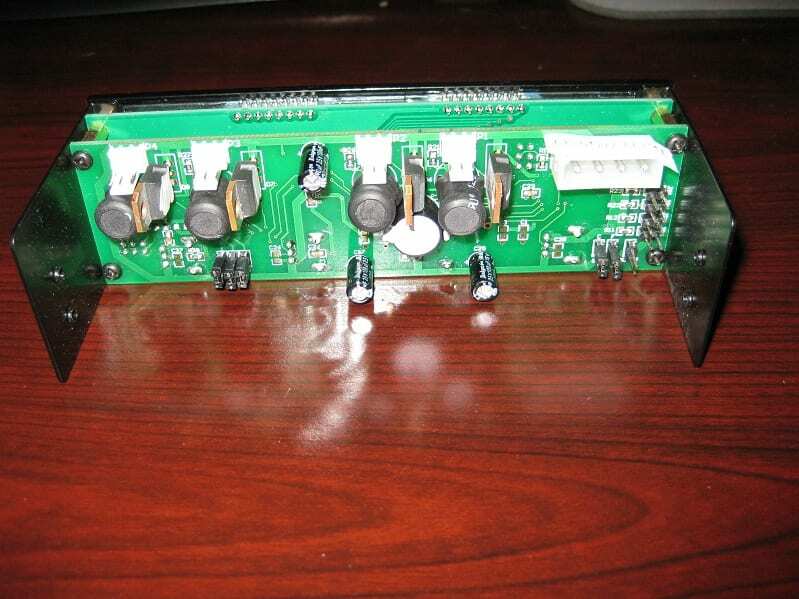 The FC5 has two PCBs. The mounting for all the fan, power, temperature headers, heatsinks and capacitors were all solid and clean. 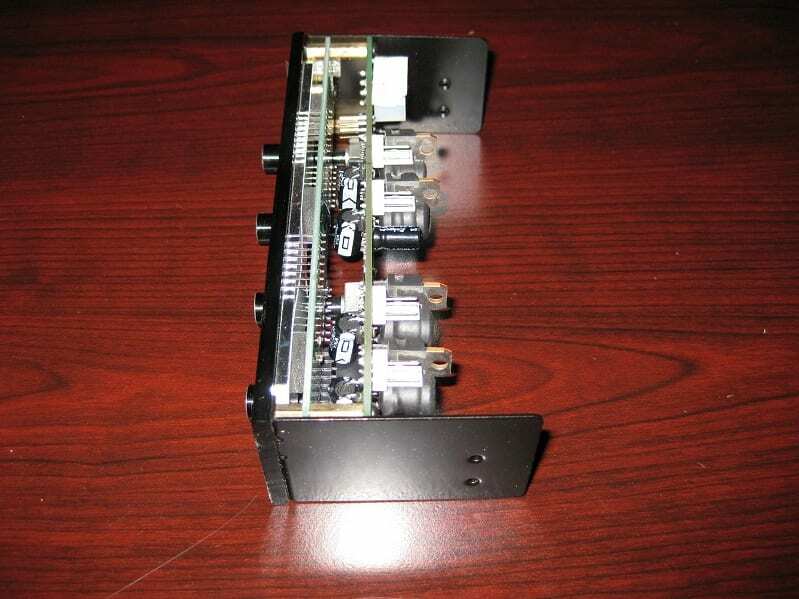 Mounting the unit was as straightforward as any typical 5.25 bay mounting in the Corsair Obsidian 800D. I used the quick clip on one side and attempted to use the supplied screws on the other side but ran into a minor issue. The threading or size of the screw hole on the FC-5 was not easily accepting of the screws that were provided. I figured it may have been because of the tough angle to get at them while mounted in the case, but unfortunately, it was not. The screws would not thread into that hole even after I removed it from the case. Luckily this wasn’t an issue as the Obsidian and many other cases have the pressure mounts on the top side of the bays along with screw-less quick mount systems. With that in place, it was nice and snug and actually even more so than the Kaze Sever, which had more flimsy (but still effective) side panels. According to the unit’s own display, the voltage can range from 0-12.1 volts. Each channel can support robust 30W. When powering on the PC, all of my Yate Loon High Speed 120mm fans spin up quickly at the start to their full speed of 2200RPM (give or take 100RPM of course) then fall gently back to my preset speed of around 1000RPM. I noticed when changing the fan speeds, this controller seems to do it noticeably slower when compared to the Scythe. Not a big deal, but took a second to get used to. The overall feel of the knobs are solid. There is a finite range of motion for them starting at approximately the 8AM position (Off) and moving to the 4PM position (Fully On). There is a nice amount of resistance in the rotation contributing to the solid feel when adjusting fan speeds. 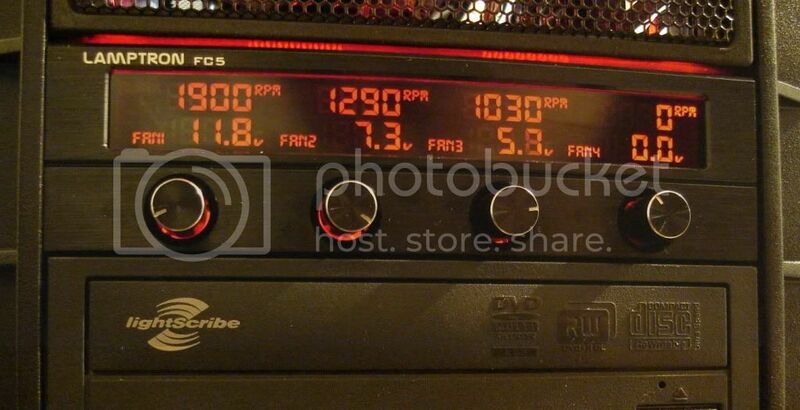 I have also tested the units 30W per channel rating by using three 2750RPM Panaflo’s provided to us by CrazyPC. 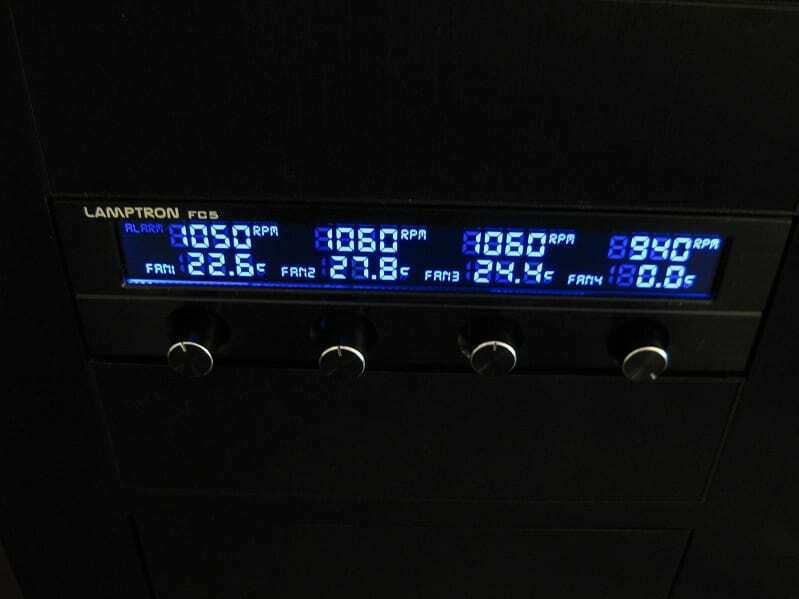 The FC-5 held up perfectly using those high speed fans all on one channel along with my 3 Yate Loons on full speed on each of the other channels. When all of the Panaflos were on the same channel, they appeared to have reached their top speed; but since they are piggy backed, the RPM readings were all over the place, which is typical for that wiring configuration. Voltages remained fairly stable across the board even with all 6 fans spinning at their fastest. 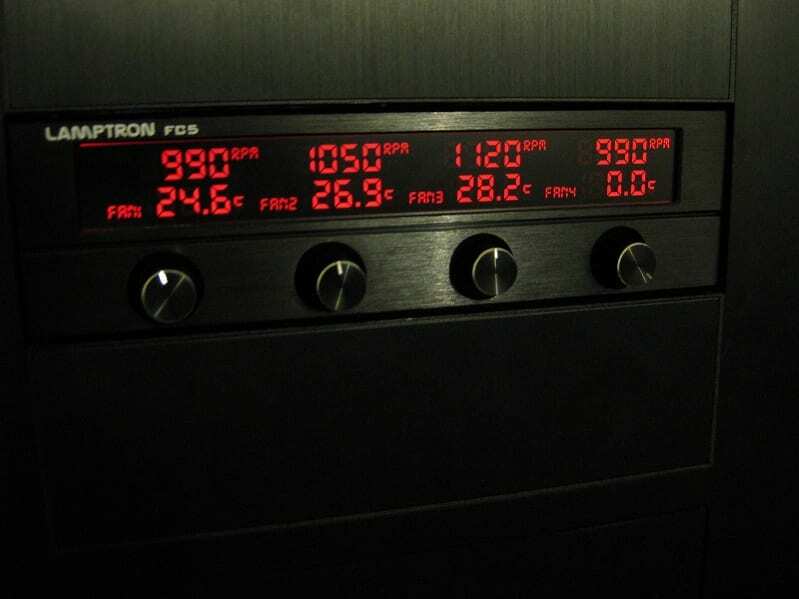 The three single fan channels never dropped below 11.9V, both on the unit’s display and when testing at the header. The channels I tested with the three fan configuration showed a little more voltage sag under load to 11.7V at the header (11.9V on the display). After cutting back to one RPM feed, all operating fans remained showed an accurate RPM reading and were stable around 2600RPM. I would not hesitate to daisy chain a couple of powerful fans on one single channel so long as their rating is under .8A at max speed. This unit can handle it. 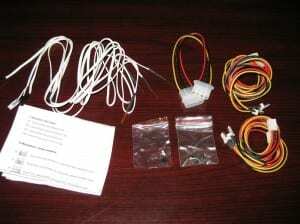 The included temperature probes were likely long enough to run anywhere in just about any case on the market. As in my previous setup, I have placed the three probes in the same place; intake for ambient temps, another taped to the bottom of the fan under the radiator, and the third above the radiator to measure its exhaust). Using my presumably accurate remote weather unit as a reference for temperatures, I found the probes to be off about 3-5°C on the high side all the way around on any channel. A 1-2°C variance could be a typical error of such equipment, but this was a bit more than that. Regardless, I found the change in temperature I experienced with the other controller to be the same on the FC-5 controller throughout all testing. I have to admit I was enamored at the fact that one can change the LCD colors on this unit! Sometimes when people build systems these days, they want it to match so its pleasing to the eye. Most single bay fan controllers are a plain ‘white’ only or maybe a different single color. As mentioned above, the unit has seven different colors you can select. I went with the blue as it seemed to match my overall scheme with the Gigabyte EP45 UD3P motherboard in use. Unfortunately, the same problems that plague other LCD displays affect the FC-5 as well. The panel starts to become unreadable the more off center you are. It appears the color you choose seems to affect the viewing angle/readability also. The blue and red I used the most during this testing seemed to have more contrast and allow for a slightly better viewing angle than the other available colors. The brighter colors seemed to have more ‘bleed’ through in the unlit sections than the blue and red. As expected, the Lamptron FC-5 works quite well and looks great in a matching black case as I expected. Currently the Lamptron FC-5 can be found at FrozenCPU.com for $54.99. Like every item though, it has its positives and negatives. The viewing angle of the LED is not optimal unless you are more or less sitting in front of the unit. Having to use jumpers on the back of the PCB to select the different colors and other display options can potentially be cumbersome for some users. A button on the front to select these features would be more user friendly and great value add for its price point. I can’t forget to mention the screw holes and screws not being a match. To be completely fair though, I do not know if this is a production issue or singular problem with the tested unit. I scoured the internet to find similar issues and came up with none so I would guess the wrong screws were included by mistake. 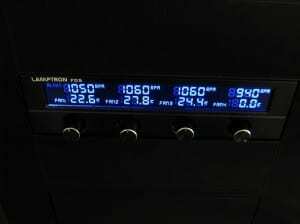 The many positives going for this controller are its overall clean look and appearance, having 30W per channel on tap (which will allow piggy backing of a couple powerful fans, up to 30W for each channel) the ability to select through seven colors on the LCD display, four lengthy temperature probes, very solid construction, and overall feel. It does ask a premium price, but delivers in performance and especially the several display colors and options the FC-5 has. A special thanks goes out to Rob and the team at Lamptron for providing Overclockers.com a few review samples of their fan controllers. CrazyPC.com also played an integral role in providing the high speed fans for more in depth testing. Did the fans make any whining noises when you turned them down to 5-7v? My FC-2 makes some horribly annoying high-pitched noises at these voltages. At full-speed there is no issue, but you don't need a fan controller if you run at full blast all the time. Jason, this is a known issue, and the latest revisions of Lamptron's FC2 are reported to not have this issue. We actually found similar behavior with the FC2 we are working on, but Lamptron is getting us a newer revision to see if its really fixed. Once we get our hands on the latest Rev, you'll see full details from Hokiealumnus. 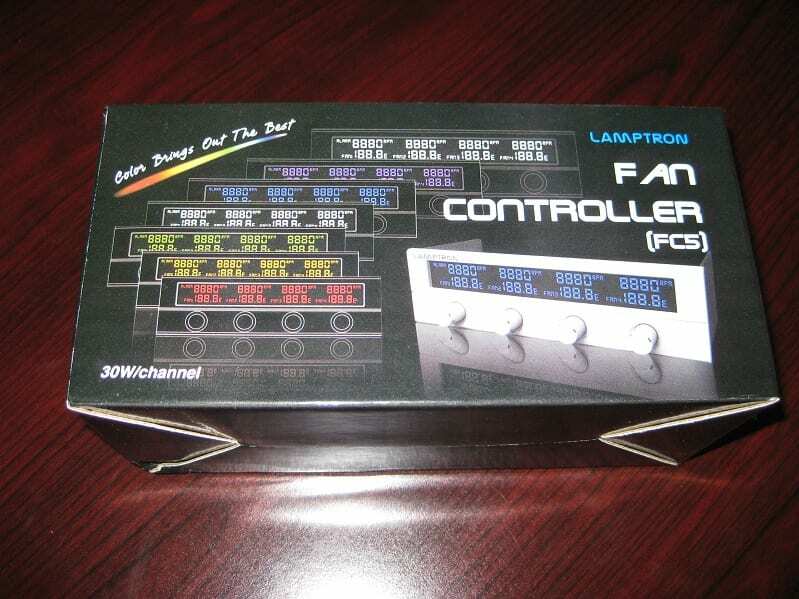 Earthdog tested a few panaflo UHS fans I sent him with this controller and he didn't have the whining problem. I don't think the FC5 ever had this issue. On the FC2 we tested these fans had the horrible whining issue when not running full blast, but the same fans worked fine on a Sunbeam controller. Hopefully he can pipe up and confirm I've got things right according to his experience, I didn't see in the article where he tested them at less than full load. I think I need to get on the ball and get in touch w/ Lamptron to see about a replacement. To me it looks like they are really trying to release some high-end products, and may have just hit a speed-bump. They've been top notch in working with us, so I'd agree with your estimation. Great review, I was able to pick one up at my local microcenter. Excellent controller IMO, I switched from a NZXT sentry mainly because of the 30w per channel. Here is my installed picture with red text, and volts showing. Im glad that worked out for you jason!